Gilbert M. Anderson appearance in Edison’s 1903 classic “The Great Train Robbery”, earned him the distinction of being the first “cowboy star” of American cinema. After starring in the primordial film, Gilbert M. Anderson, who was born Max Aaronson, decided the film industry was for him. He played a variety of roles until he joined Vitagraph where he began directing as well as acting in one-reelers including the 1905 hit “The Raffles, The American Cracksman.” He then moved to the Selig Polyscope Company. In 1907, he teamed up with George K. Spoor to form the Peerless Film Company. 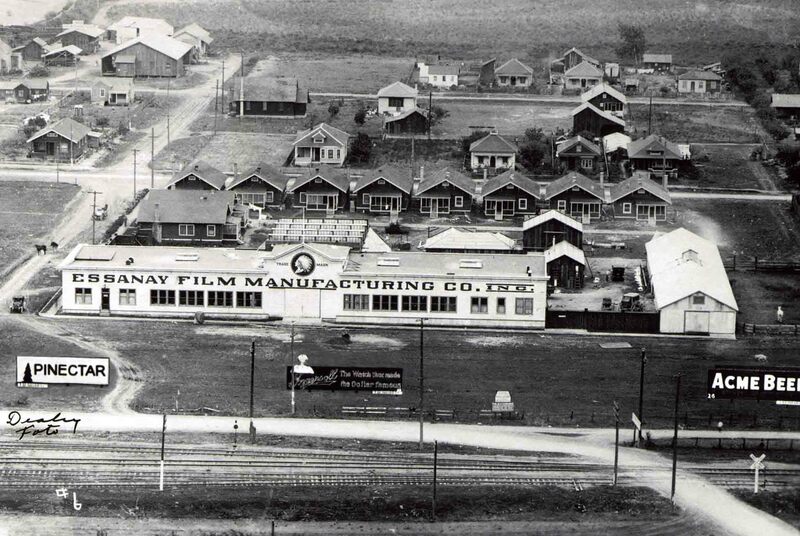 On August 10, 1907, the name was changed to the Essanay Film Manufacturing Company, combining the first letters of their names (S and A). Their first studio, located at 496 Wells Street in Chicago, produced their first film, “An Awful Skate; Or, The Hobo On Rollers”. After making scores of movies there, Spoor purchased land on Chicago’s outskirts and began work on a 72,000 square foot studio. After construction was completed, the new Chicago studio produced many of Essanay’s most famous movies, including “Sherlock Holmes”, and “The James Boys Of Missouri.” Many of its actors, such as Francis X Bushman, Gloria Swanson, Wallace Berry and Ben Turpin. got their start at Essanay and later became well known and highly paid stars. Most of the early films made at the Chicago plant starred, and were directed by, George Anderson. In 1910, he starred in “Broncho Billy’s Redemption” which was extremely well received by theater audiences. Encouraged, he went on to develop a total of one hundred and forty Broncho Billy films, in which he acted and/or directed. As with other Chicago motion picture companies, Essanay’s winter film production slowed to a snails pace, due to the inclement weather. Having heard of California’s “hospitable” climate Anderson was ready to make the move west. After five years of making over four hundred films in Chicago, Anderson packed up his troupe and moved to California where they filmed in several locations including, Santa Monica, Lakeside Santa Barbara and San Rafael. 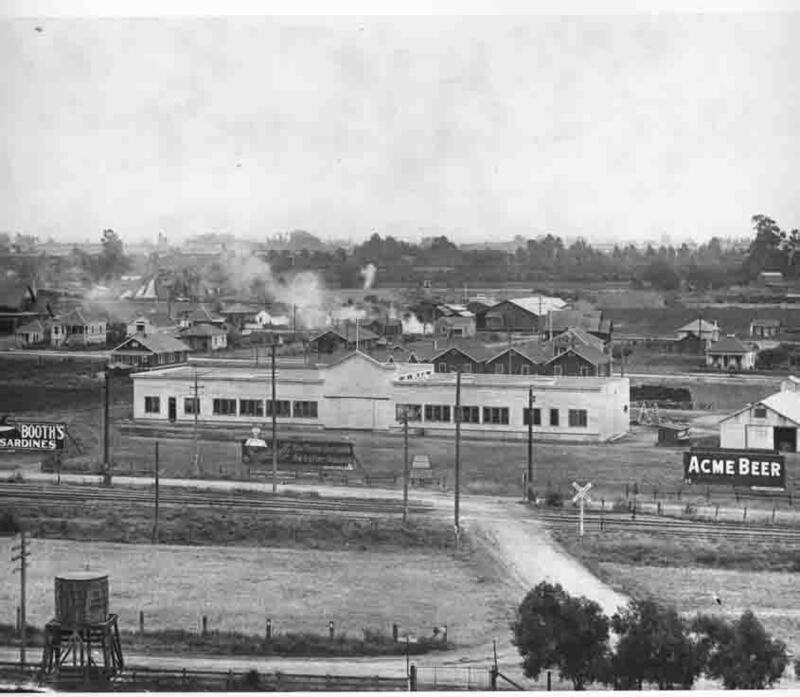 Finally, in 1913, they found the perfect spot for a new studio for their westerns -- Niles, California, just a few miles southeast of San Francisco. Shortly after their arrival, Anderson began purchasing several lots and pieces of land for their new studio. With a site selected, construction of a new studio was begun in early 1913 under the supervision of Alfred Griffin, a local contractor. By June, the main building, 200 feet long and fifty feet wide, was ready to occupy. On June 11th, director Lloyd Ingraham inaugurated the studio with its first production. In the next few weeks, a concrete horse stable was finished, followed by a glass-enclosed interior stage, a blacksmith shop, a western street exterior set and four bungalows. Each week, a minimum of two fifteen minute one-reelers were made in Niles. Occasionally, the number rose to four or five. 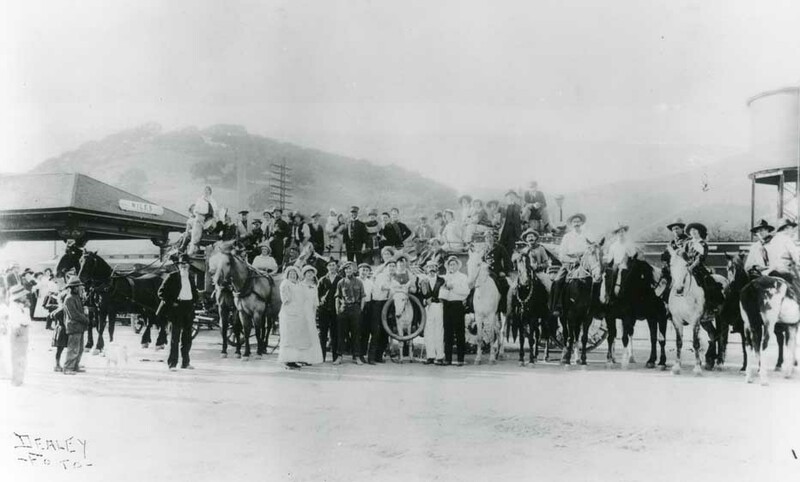 The whole community provided a backdrop for these productions, and the local residents frequently stood in front of the camera as part-time actors. Even though the studio had a large storage full of props to decorate the interior sets, neighbors often found the property master at their doorsteps asking for anything from bric-a brac to a kitchen stove. On at least one occasion, a six week-old baby was borrowed. During Essanay’s years in Niles, the company increased its staff to eighty. Their combined annual salaries added up to $200,000. The cost to make each film averaged $800 and brought in as much as $15,000. But the totals changed when Charlie Chaplin was signed by Essanay. In late 1914, Essanay succeeded in hiring Charlie Chaplin away from Mack Sennett’s Keystone Studio, offering Chaplin a higher salary and his own production unit. Chaplin made fourteen short comedies for Essanay in 1915. He also made a cameo appearance in one of the Bronco Billy westerns. Chaplin made his first Essanay film in Chicago but didn’t like it there. He moved to the Niles studio where he stayed for almost three months and made “A Night Out”, “The Champion”, “In The Park”, “A Jitney Elopement” and “The Tramp.” He then moved to Los Angeles, in April 1915, to finish out his contract. His Essanay films were more disciplined than the chaotic roughhouse of Chaplin’s Keystones, with stronger plots and better character development. The landmark film of the Chaplin series was “The Tramp”, in which Chaplin’s vagabond character finds work on a farm and is smitten by the farmer’s daughter. Unable to win over the daughter’s love, the film ends with the famous shot of the lonely little tramp, with his back to the camera, walking down the road dejectedly, then squaring his shoulders optimistically and heading for his next adventure. Audiences loved the humanity of Chaplin’s character and soon he was a favorite at the box-office. His yearly income, including a bonus, was $75,000. However, each of his films brought in almost twice that amount. By 1915, the times were clearly changing for Essanay and many of the other pioneering film companies -- they were facing stiff competition from upstart producers and studios in Hollywood. The new feature length film captured audiences, who before were previously satisfied with the one and two reel movies. Anderson wanted to begin making “features” but Spoor, who controlled the finances and distribution, wouldn’t hear of it. When Chaplin’s contract came up for renewal in December, 1915, Spoor rejected Chaplin’s salary demands -- $10,000 a week plus a hefty bonus to sign his name on the contract. Consequently, Chaplin returned to Hollywood and opened his own studio. Anderson was livid with Spoor over his handling of the Chaplin contract renewal. Coupled with his inability to make feature type films at Essanay, Broncho Billy offered his shares of stock to the highest bidder, and Spoor paid up. A few months later, on February 16, 1916, Spoor sent a telegram to the manager of the Niles studio ordering it shut down. The doors were closed and locked. During the three years of its stay in Niles, Essanay produced over three hundred westerns, plus scores of comedies. The Essanay company joined in a four-way merger orchestrated by Chicago distributor, George Kleine, in 1918. Kleine’s new combine, V-L-S-E, was a amalgam of the Vitagraph, Lubin, Selig and Essanay companies and would distribute the partners’ films. Only the Vitagraph brand name continued into the 1920s, and was absorbed by Warner Brothers in 1925. Visit the hollywoodphotos.com website to view the largest collection of vintage Hollywood photographs.